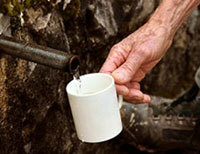 Bacteria in water and other pathogens cause a variety of diseases. Waterborne diseases are caused by microorganisms like bacteria in well water, viruses, protozoa, and helminths (parasitic worms). In developing countries four-fifths of all the illnesses are caused by water-borne diseases, with diarrhoea being the leading cause of childhood death. The global picture of water and health has a strong local dimension with some 1.1 billion people still lacking access to improved drinking water sources and some 2.4 billion to adequate sanitation. Today we have strong evidence that water-, sanitation and hygiene-related diseases account for some 2,213,000 deaths annually and an annual loss of 82,196,000 Disability Adjusted Life Years (DALYs) (R. Bos, Dec. 2004). WHO estimates indicate that worldwide over 2 billion people are infected with schistosomes and soil transmitted helminthes and 300 million of these suffer serious illness as a result. Malaria kills over a million people every year, and a large percentage of them are under five as well, mainly in Africa South of the Sahara. In 2001 the estimated global burden of malaria amounted to 42.3 million DALYs, constituting 10% of Africa’s overall disease burden. 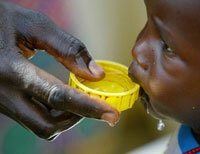 Malaria causes at least 396.8 million cases of acute illness each year. Pregnant women are the main adult risk group. As one of the major public health problems in tropical countries, it has been claimed that malaria has reduced economic growth in African countries by 1.3% each year over the past 30 years. The antioxidants are believed to help protect the body from free-radical damage primarily responsible for human diseases. Free Radicals are responsible for nearly all human diseases from minor to the most dangerous. 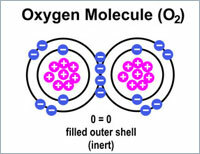 They are atoms or groups of atoms with unpaired number of electrons formed when oxygen interacts with certain molecules. Once formed these highly reactive radicals can start a chain reaction, like dominoes. Their chief danger comes from the damage they can do when they react with important cellular components such as DNA, or the cell membrane. Cells may function poorly or die if this occurs. To prevent free radical damage the body has a defense system of antioxidants. Fullerenes are considered to be about the most powerful antioxidant. Fullerenes in natural form are encountered only in Shungite – the mysterious mineral discovered only in one place on Earth - in Russian Karelia. In some of NAQWA water recoverers the best Russian shungite is utilized to provide additional antoxidation of drinking water. Water molecules are attracted or loosely attached to each other through hydrogen bonding. In normal water this attraction makes water ”cluster” together in large assemblies of water. These clusters have size and shape; both their size and shape can affect biological organisms. 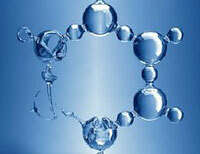 The water molecule, made up of two hydrogen and one oxygen atoms, is what most of us think of as water. The true picture is a little more complex. These molecules appear to be very gregarious. They like to get together and are seldom found alone. They will cluster in groups of from five molecules to over 600 molecules. These groups are not static. Water molecules will switch from one group to another very easily and do so often. Hydrogen bonds are being made and broken several times a nanosecond. This creates the unimaginably dynamic energy environment of water. It is the size and shape of these clusters of molecules in their never ceasing interaction that is the “structure” of water. 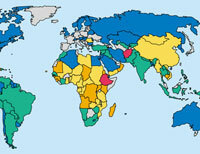 • 117 million disability adjusted life years (DALYs) lost annually due to diarrhoea and intestinal worm infections. 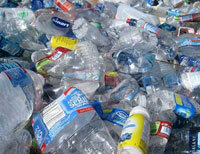 Hopefully you are well aware of the alternatives to using disposable bottles and recycle the ones you do. The advent of bottled water sent our already wasteful consumer culture into pollution overdrive and it's a tremendous task to put the brakes on the momentum of this waste.